Colon walked Carlos Correa to start the eighth before Josh Reddick lined an 0-2 delivery down the right-field line for a double that put runners at second and third, spoiling the no-hit bid as well. Chirinos homered in the third for the only hit off Verlander, who struck out 11 over eight innings. 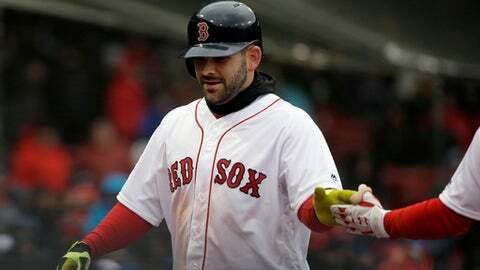 BOSTON (AP) – Andrew Benintendi got three hits and Boston extended the best start in its 118-year history by beating Baltimore at frigid Fenway Park. The series was supposed to last four games, but the traditional Patriots’ Day game scheduled for Monday morning at 11:05 a.m. was postponed late Sunday afternoon because of a forecast that calls for heavy rain throughout the day. Boston ace Chris Sale gave up one run and two hits in five innings, striking eight and walking two. Dylan Bundy (0-2) gave up three runs – one earned – and seven hits in 5 2/3 innings with six strikeouts, two walks and two wild pitches. ST. PETERSBURG, Fla. (AP) – Aaron Altherr hit a three-run homer, Scott Kingery had a three-run double and Philadelphia won its sixth in a row. Reliever Yacksel Rios (2-0) went 1 1/3 scoreless innings. NEW YORK (AP) – Wilmer Flores hit a game-winning home run with two outs in the bottom of the ninth inning and New York beat Milwaukee to improve the best start in team history to 12-2. WASHINGTON (AP) – Ian Desmond hit a tiebreaking, two-out homer in the ninth inning against his former team, Charlie Blackmon drove in three runs and Colorado rallied to beat Washington. Adam Ottavino (3-0) got the win despite allowing a run in the eighth. MIAMI (AP) – Starling Marte went 5 for 5 with a ninth-inning homer to help Pittsburgh beat Miami. Jose Urena (0-3) allowed eight hits and four runs in five innings. After four starts, the Marlins‘ ace has an ERA of 5.57. CINCINNATI (AP) – Carlos Martinez struck out a season-high 11 batters in seven shutout innings and Harrison Bader’s two-run home run helped St. Louis complete its first four-game sweep in Cincinnati since 1949. The Reds haven’t enjoyed a lead in 32 innings, going back to the fourth inning on Thursday. They are 2-13 for the first time since the 1931 Reds won two of their first 19 games. Homer Bailey (0-3) allowed four hits and three runs with four strikeouts and two walks in a season-high seven innings. SEATTLE (AP) – Sean Manaea pitched seven strong innings and Jed Lowrie hit an early two-run homer off Felix Hernandez to lead Oakland over Seattle. Lowrie provided all the offense the A’s needed with his fourth homer in the first inning. Blake Treinen finished with a four-out save. Felix Hernandez (2-2) worked into the seventh inning for the first time this year, giving up five hits in 6 1/3 innings. LOS ANGELES (AP) – Clayton Kershaw struck out 12 and pitched two-hit ball over seven innings and Los Angeles Dodgers ended an 11-game losing streak against Arizona in the regular season. SAN DIEGO (AP) – Joey Lucchesi struck out nine in six innings, fellow rookie Christian Villanueva homered, doubled and drove in three runs, and San Diego cruised past San Francisco 10-1.